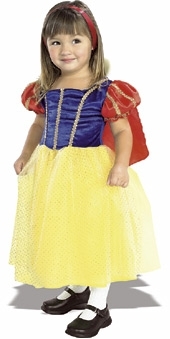 Your little girl can have lots of fun acting out her favourite fairy tale in this fabulous Snow White dress. With brocade style ribbon on bodice and sleeves, attached cape, and net overskirt she will really feel like a princess. Available in toddler, small and medium sizes.